“Baudin saw no justification for dispossessing the Tasmanians of their land. His observations of their life and customs had not led him to believe that they would benefit from the 'civilizing influence' of the Europeans, as Peron believed the Aborigines of Port Jackson had done. ‘Encountering Terra Australis’, J Fornasiero and J West-Sooby, 2004 Baudin, La Perouse and d’Enrecasteaux created a French imperial inheritance by exploring and recording Indigenous people, flora, fauna and landscape. 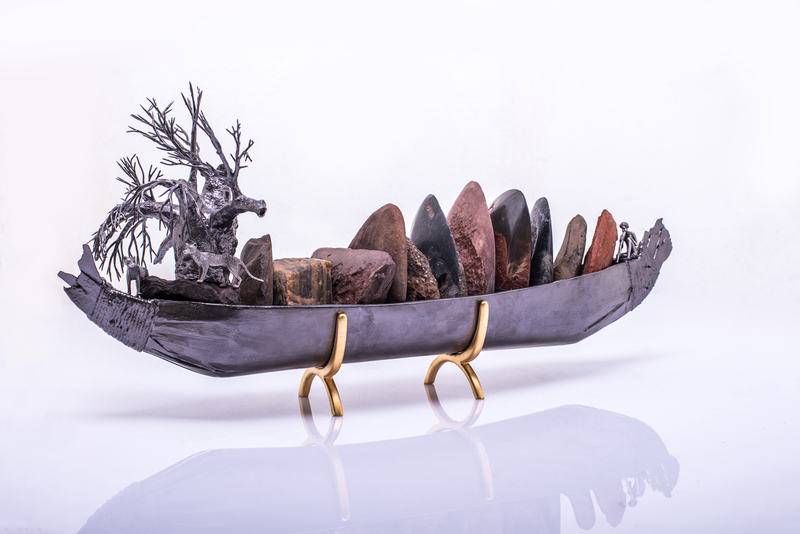 The archaizing of Paul E Mason’s reliquaries attempt to bring the past and present together through a combination of traditional and modern materials This inevitably suggests ceremony and a romanticized image of Indigenous people and explorers. A zone between icon, trade reliquary and artefact is cross cultural in nature. These works reuse ancient and modern artefacts combined within a single image. Elements from different time zones morph into a new sculpture. We can ascertain something of the maritime explorers’ attitude to past and present cultures. It also enables us to appreciate the relationships between ancient and contemporary objects and understand the reasons behind their collection, extinction, reworking and revival. Paul E Mason’s Looking for Baudin exhibition is present as a counterpoint to the presentation of Animalia Australis – an Art Gallery of Ballarat touring exhibition.